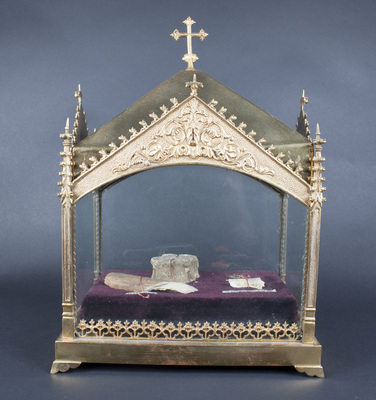 "Reliquary casket containing a remnant of a clothing of Saint Catherine"
Reliquary casket containing a remnant of a clothing of Saint Catherine of Ricci, a remnant of the habit of Saint Veronica Giuliani, and relics of Saint Nicholas of Myra, Saint Domitilla, and an unidentified individual. The document certifying the authenticity of this relic can be downloaded below as a PDF file. Saint Catherine de Ricci (1522-1590) was a mystic who bore the stigmata. Saint Veronica (1660-1727) was a nun who bore the stigmata. Saint Nicholas (270-343) was the bishop of Myra, and is the inspiration for Santa Claus. Saint Domitilla (55 - approximately 90 AD) was the granddaughter of the Roman emperor Vespasian.